Thomas Struth was born in Geldern, Germany, near Düsseldorf, in 1954 and attended the Düsseldorf Academy from 1973-80, where he studied painting under the instruction of Gerhard Richter. 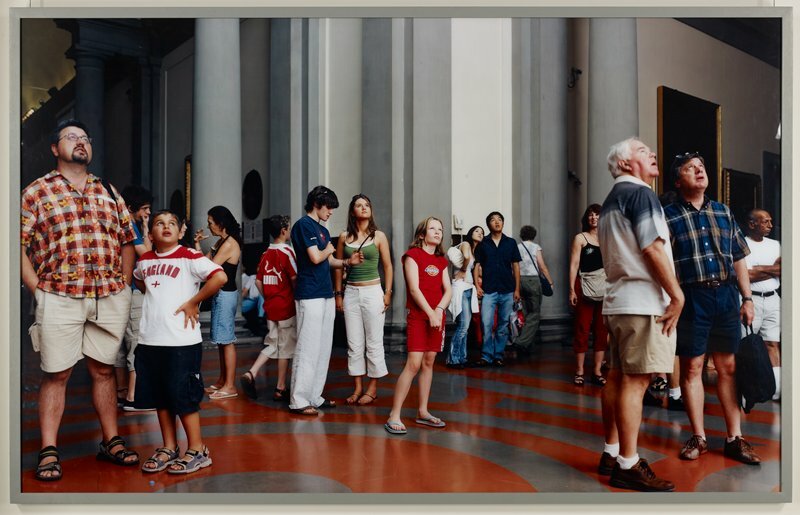 For the last twenty years Thomas Struth has been photographing in the galleries of European and American museums, capturing viewers in the act of looking, often at recognizable works of art. More recently he has created images in which the art object is not visible and goes unidentified, as in the case of this image. A little museum sleuthing reveals that the audience here is taking in Michelangelo’s David, one of the world’s best-known sculptures. In every picture from his ongoing series “Museum Photographs,” Struth makes the viewers his—and consequently our—subject. In Audience, we look at how museum-goers, like us, respond to and perceive art in museums.